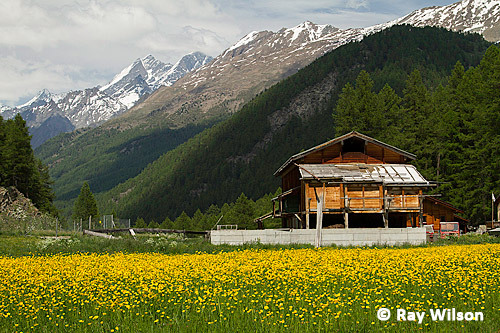 Bisected east to west by the Rhone valley with high Alpine peaks towering upwards to the north and south, the canton of Valais in southwestern Switzerland has a very wide range of altitudinal habitats within a compact geographical area, making this area one of the most botanically diverse areas in Europe, and it was the spring Alpine flowers that were my main focus on this trip. 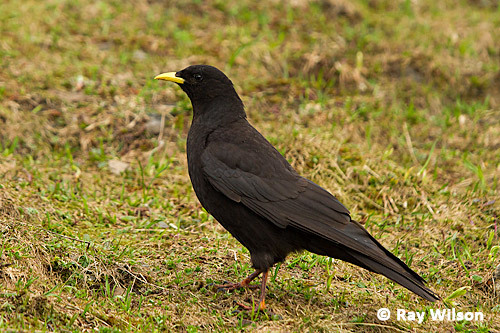 Since getting to the high altitudes necessary to see alpine wildlife is very easy in Switzerland due to the skiing infrastructure, with several resorts operating trains or cablecars to high altitude ski stations throughout the year, this trip also provided a great opportunity for me to photograph several high-altitude bird and mammal specialists that had so far eluded my lens. 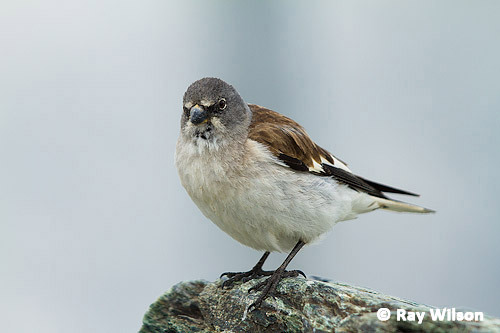 The first of these were Snowfinches, which typically live in small loose colonies above the tree-line on barren, rocky slopes and meadows where they principally feed on the seeds of alpine plants (although the young are fed entirely on invertebrate prey until they fledge). They are frequently found near buildings and are often attracted to ski-stations where they scrounge for crumbs from the tourists. 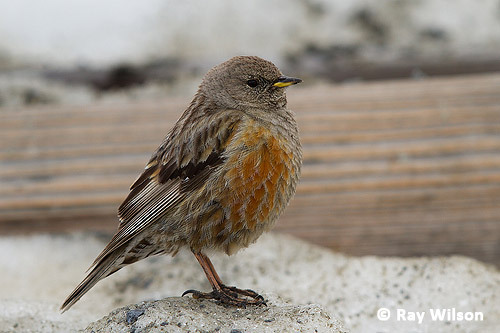 Alpine Accentor is another species well adapted to the harsh alpine environment and breeds above the tree-line in alpine meadows devoid of shrubs or bushy vegetation. 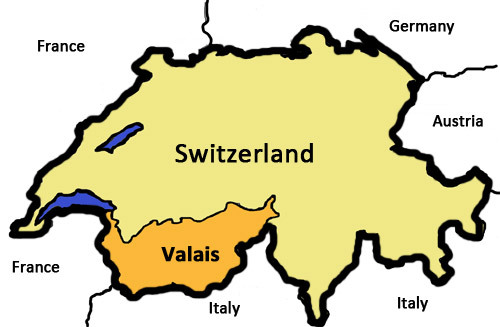 In the Swiss Alps this equates to altitudes of 1800-3000m (approx. 6000-10,000ft). 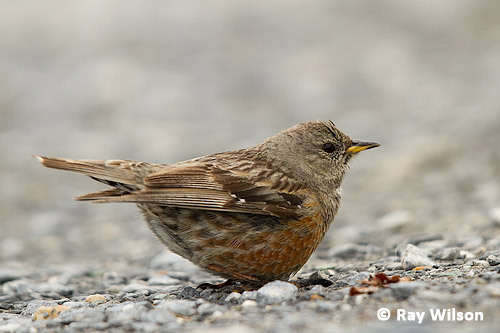 On their breeding grounds, Alpine Accentors generally live in small groups of 2-5 males and 2-5 females. 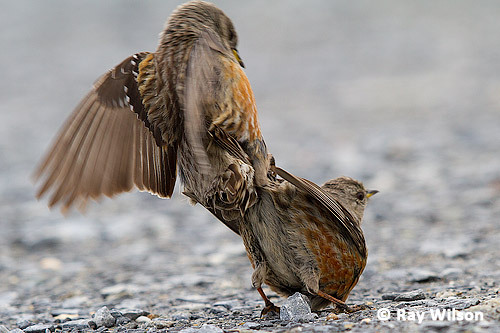 This arrangement has the advantage of having more adult birds foraging for invertebrate food to feed to the young, but does lead to intense sexual competition. 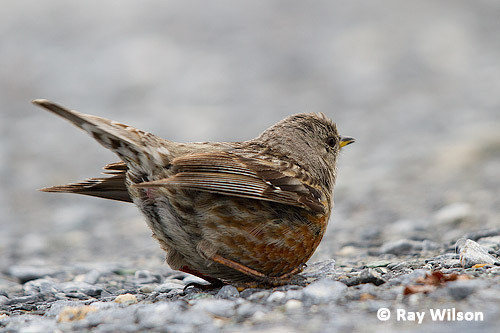 Females usually initiate mating by adopting the tail-up posture, shown in the photos above and below, with her bright red cloaca pointing towards the male while rapidly vibrating her wings and flicking her tail from side to side. 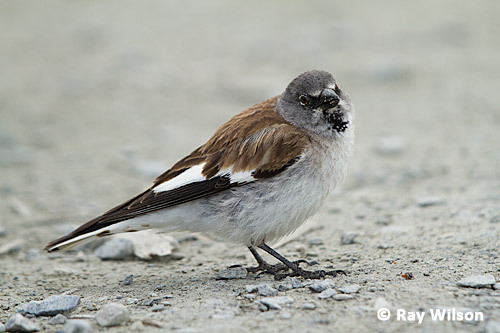 Since the females are promiscuous and it is usually the sperm from the final copulation that fertilises the eggs, matings are frequent between the members of the group and a female may copulate up to 1000 times before laying a single clutch of eggs! 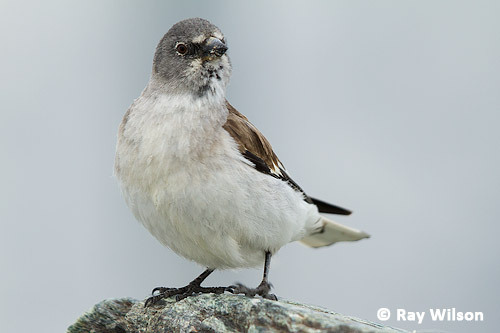 In order to cope with this level of sexual activity, one of the highest in all birds, the males have evolved proportionally very large testes which make up 8% of their total body weight. Copulation itself is extremely rapid and is over in a fraction of a second (see photo below). In contrast to the Snowfinch and Alpine Accentor, I wasn't quite so lucky with Alpine Chough, the last of my main high-altitude avian targets, and I had to work quite hard to get any decent photos. It wasn't that they were difficult to find, just that every time I started to get within photographic range, either another stream of noisy tourists would arrive at the station or some hikers would walk past and put the whole flock into flight again. 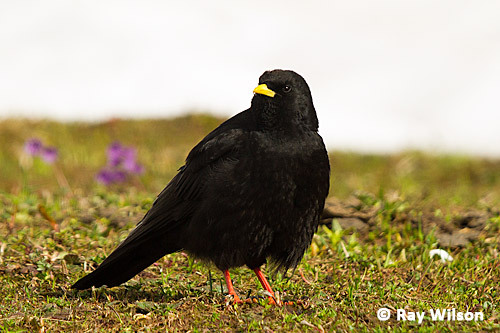 Like its close relative, the Red-billed Chough, Alpine Choughs are specialized insectivores and use their narrow, curved bills to dig up subterranean invertebrates. They are, however, also not adverse to scavenging for scraps from the throngs of tourists at ski resorts. 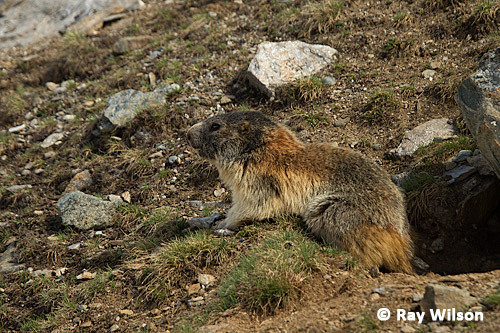 Alpine Marmots are common on alpine meadows above the tree line (the two photos below were taken at altitudes of about 2200m and 2800m respectively) and their presence is easily detected by their loud, high-pitched alarm calls. 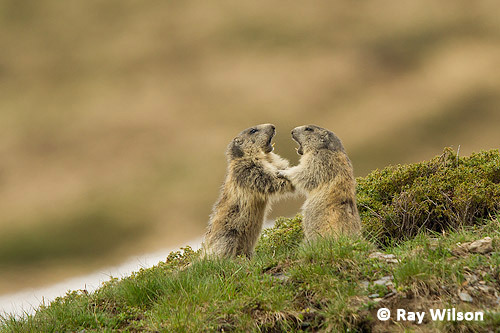 They tend to be more numerous on south-facing slopes due to the milder micro-climate reducing the amount of weight lost during hibernation and thus have an increased breeding success in comparison to marmots living on north-facing slopes.